Over the years of being a Nanny I have seen quite a few Kaloo Products over the years in children’s room. My favourite was always the Poupon stuffed toys. I have seen many colors and was very excited to receive for review the newest addition to the family, Blue Poupon. (available July 1 2010) I love the hat box they come in which can be used for other things such as hair clips, and accessories. 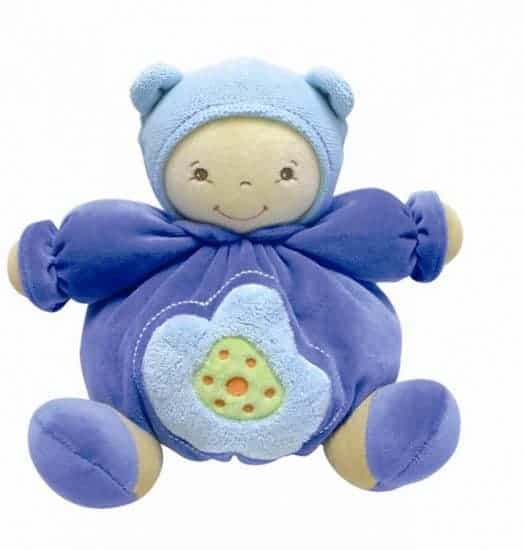 The plush toys are so soft and cheery looking that any baby will have a hard time not loving them. They are machine washable which is great as well. These would make really nice baby gifts and even for older children as well. ($31.99 US) Sadie loves this one. They also come in Fuchsia, Green and Tangerine. To see the Blue Poupon and the rest of the Kaloo collections go to www.Kaloo.ca They have lots to choose from including musical toys, play mats, diaper bags, furniture and even jewelry for mom. Kaloo is offering my readers a 30% discount on all items with the coupon code Stacie-kaloo (excluding furniture on our retail site (www.kaloostore.com). Valid until July 31, 2010.